Growing up as little girls, I’m sure there are those moments you dream of. Your wedding day is certainly one of those days. How it will be as you take those first steps down the aisle…how it will be when you kiss your prince for the first time…how magical it will feel to walk hand in hand towards your friends and family. 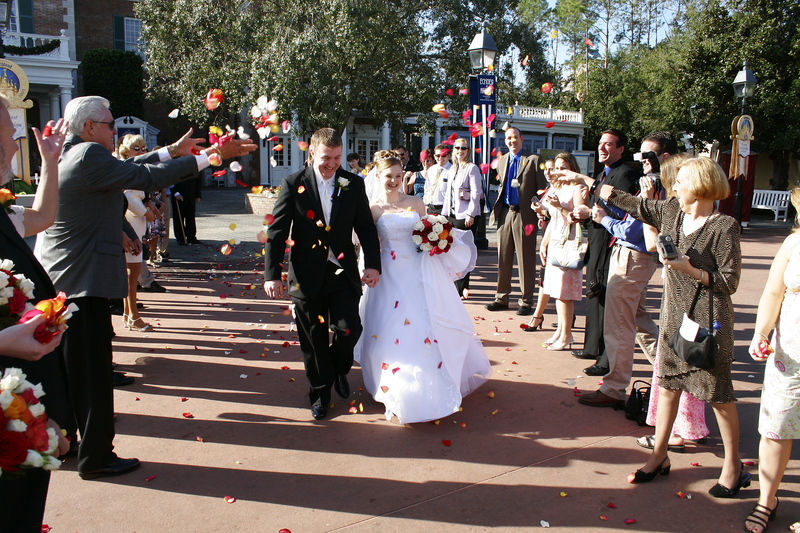 Many couples give lots of thought to how they will exit their ceremony venue. Thankfully there are many options offered by Disney as well as some home spun ideas for them to choose from. 1. 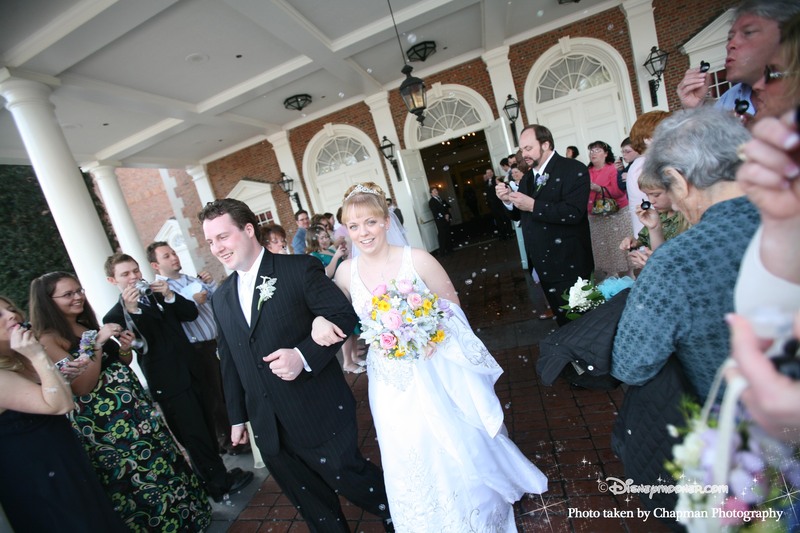 Bubbles: Always a classic, brides and grooms come back to this staged exit option all the time. The pictures are always filled with laughs, some funny moments when the bubbles blow into faces and really set an atmosphere of whimsy to the photographs. There is always this concerns with brides that the bubbles leave a stain on the dress fabric……to this day we have yet to have a brides say there was a stain on her dress. Not to say it can’t happen but we hope that little fact puts some worried brides at ease. 2. Rose Petals: Romantic and charming, this is another classic staged exit that couple adore. Petals often match the couple’s wedding colors or have several tones of the colors. These can be very custom and brides have rose petal cones made with their monogram for guests to hold. 3. Ribbons Wands: This is more of a modern trend but we love it. These are great ways to making a unique exit with a splash of color and nothing getting thrown in your faces. 😉 Disney can make these for you or perhaps you can make these yourself to save in your budget. 4. Fireworks at the WP: for a real wow factor we have seen couples plan for a surprise fireworks exit at the wedding pavilion. This really adds a sense of magic to the exiting of the new couple. 5. Sparklers: We have yet to see sparklers being used in a Disney Wedding ( and perhaps they won’t allow that) but we think this is a really great idea none the less. 6. Balloons! – One of the newest trends we have seen in the world of weddings is a staged balloons release. Again, we have never seen this done at a Disney wedding or if it’s allowed, but we still think it’s pretty cool. And how perfect if you are doing an UP! themes wedding? We would love to hear what other type of staged exits you have had!! Please come share with us at the Disneymooner private forums now!